The Intense Series 7400 our diode laser turnkey systems that provide a simple and reliable solution for operating high power Visible and IR Laser Diodes. Designed for ease of use, the systems integrate the Laser Diode with a Driver, Temperature Controller and user-friendly Interface Computer in one low cost package. The systems can be readily customized to meet the needs of many applications. The 7401 is a portable turnkey system designed specifically for use with series 5200 or series 5300 laser modules. 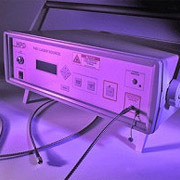 The system is available in wavelengths from 630 to 690nm. With outputs as high as 4W CW, the system is warranted for one year. This simple turnkey solution has applications in PDT research, illumination, tracking and robotic vision. The 7403 is the OEM ruggedized version of the 7401. The laser system has no front panel controls and is designed for primary operations with RS232 commands. Applications include illumination, tracking and vision systems. The 7404 is a smaller turnkey system, weighing only 5lb. Front panel controls adjust power and temperature. The system is designed to drive nonmodular, free space and fibered components. The fibered lasers are mounted internally and have an optical connector on the front panel. Free space lasers are mounted on an external, TE cooled head. Applications include RGB displays, PDT research, illumination and laser therapy.